“Weighing the merits of this proposal was challenging, because I know how badly the schools in my district need funding. The fact remains that there are other ways to get money to schools that would not have jeopardized future education resources. The House Republicans wouldn’t allow those options to be considered. Instead, we voted on a controversial compromise. I supported the bill that will provide more funding for our schools and opposed the bills that limit education spending in economic downturns, cap future spending and raid the state land trust fund. I voted against the bills that would jeopardize the sustainability of our state’s economy. House Democrats tried to get Arizona kids a better deal in the K-12 inflation funding settlement. The agreement was controversial as it puts around $3.5 billion over 10 years into schools but has some serious pitfalls. 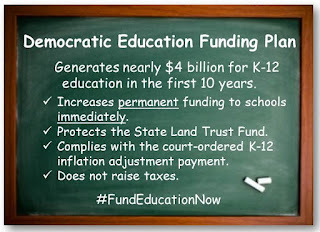 Along with the money, the plan has constitutional caps on education funding that could keep Arizona buried in the bottom tiers of per-pupil funding in the nation. The legislation also includes economic triggers that will limit spending on schools during economic downturns and will raid the state land trust. Each of these caveats seriously jeopardizes the resources available to students in the future. 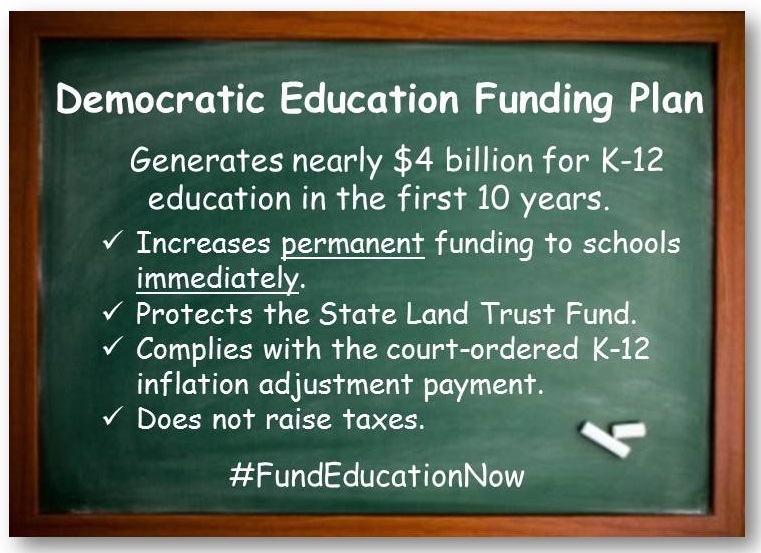 Democrats attempted to amend the plan and protect future education resources. But these efforts were met with party-line opposition. The settlement deal was divided into three different pieces of legislation. House Democrats voted to support the bill that would provide money for schools, while rejecting the bills that would have instituted the caps, the economic triggers, a raid on the state land trust and a costly special election. Although there were differing opinions throughout the process, the one thing all the Democratic members agreed on is that this deal cannot be the last word on education funding. 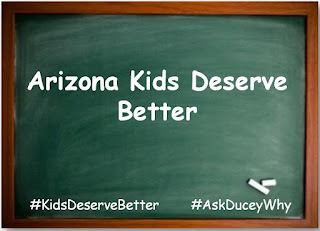 The recent agreement does not solve all the issues facing Arizona schools. The legislative session will begin in a few months, and we must commit to doing more for Arizona teachers, students and parents. 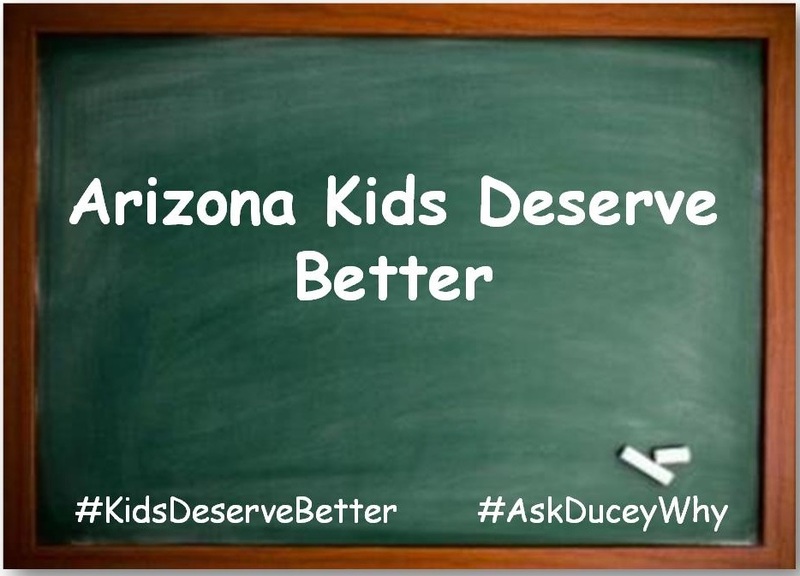 Long-term, sustainable funding for our schools must remain a top priority because Arizona #KidsDeserveBetter. At the Capitol, right now, legislators are considering a controversial education funding proposal that could affect school spending for generations. The governor called for a special session to debate the proposed K-12 education funding lawsuit settlement. The details of the deal are complex. The plaintiffs have agreed to receive just over 70 percent of the court-ordered payment for inflation funding. This is not enough money to substantially affect our bottom-of-the-barrel national ranking on per pupil funding. And schools would have to wait until next summer to get the money when there are other options that would provide immediate funding. While this may be the best deal the organizations involved in the lawsuit could get, it is not enough to fix the funding crisis in our schools. If the deal gets legislative approval, Arizona schools would have to make do with just over 70 percent of what the court says they are owed. And 70 percent is a C average. Our kids deserve better than that. This settlement absolutely cannot be the final word on the matter. There is money in the general fund that could go to schools now and could be used to protect resources for future generations. Schools have weathered years of budget cuts which stripped away billions of dollars. We have an obligation and a responsibility to find a long-term funding plan for education. Getting schools the resources needed to prepare Arizona kids for 21st-century jobs and a global economy must remain an ongoing priority. STATE CAPITOL, PHOENIX – House Democrats will hold an open caucus meeting to discuss the K-12 inflation funding lawsuit settlement. The public and press are encouraged to attend. This meeting will also be streamed online and available at this link. 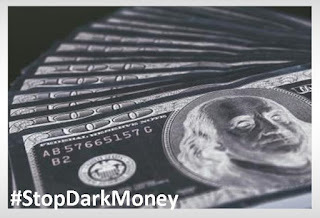 Arizonans get another opportunity to stop dark money and provide for fair and transparent elections in our state. They can demand accountability at the upcoming Citizens Clean Elections Commission on Thursday, October 29, 2015. The Commission will be voting on new rules that will shine light on dark money groups in Arizona. The Secretary of State’s office, however, opposes the Commission’s efforts to clarify murky laws and provide guidance to organizations and candidates who participate in our elections. In the most recent legislative session, the Republicans revised Arizona election law regarding who must register as a political committee and disclose where they get their money and how they spend it in elections. That new law allows an organization whose “primary purpose” is not influencing an election to hide its spending from the public. But how do you know what an organization’s “primary purpose” is? The new law doesn’t answer that question. And that’s just the way the Secretary of State’s office wants it. That’s where the Clean Elections Commission has stepped in and courageously chosen to take action against shady groups that want to influence your vote, not tell you where they get their money or what their agenda is. The Commission is set to adopt a rule that defines “primary purpose” and will require disclosure by organizations who meet that definition. This will allow voters to know who’s playing in their elections. The Commission needs to hear from you and know that you support its efforts for fair and transparent elections. When: Oct. 29, 2015 at 9:30 a.m.
Click here to learn more about the Citizen's Clean Election Commission. DCS situation remains critical and funding "not well spent"
Not long after announcing that his agency failed to spend money on the programs it was intended for and that he could not account for all of the agency’s spending, DCS submitted a funding request for the 2017 fiscal year, including a request for an additional $65 million for this fiscal year. At the last meeting of the Arizona Legislature’s Child Safety Oversight Committee , Director McKay provided shocking testimony. He said candidly that many employees are overwhelmed by the sheer volume of their caseloads. He shared that an employee confided that many of the staff have boxes under their desks of “abandoned cases that came from the last people that quit,” and that there is pervasive concern that a child in one of the cases in those boxes could die. He made these comments after a Chapin Hall presentation outlined the findings of an audit of the Arizona child welfare system. The audit showed that the state faces challenges in safety as the number of reports and investigations is much higher now than it was five years ago. It also indicated that family preservation and support, as well as permanency, are problems because the number of children in foster care and the length of time they spend in foster care have both increased in the past five years. During the hearing, Rep. Debbie McCune Davis, D-Phoenix (District 30), asked if the governor or the governor’s staff have requested a briefing on the report– the answer was not reassuring. The situation with DCS remains critical, although DCS did recently release a new plan with five strategic goals. Child safety advocates recommend a three-tiered approach to translate that plan into action that includes increasing in-home services, developing clear and consistent decision-making protocols for DCS and increasing DCS capacity to match the workload. 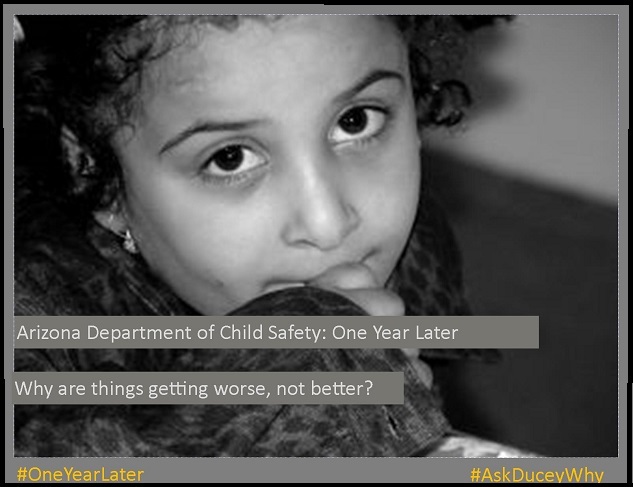 The bottom line is that Arizona’s children do not seem to be safer now than they were a year ago. 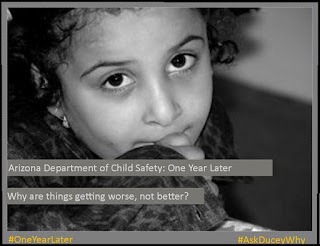 We must #AskDuceyWhy he hasn’t shown the right kind of leadership in protecting some of Arizona’s most vulnerable children and why #Oneyearlater the DCS backlog is higher than before. To review the entire Child Safety Oversight Committee hearing, click here.